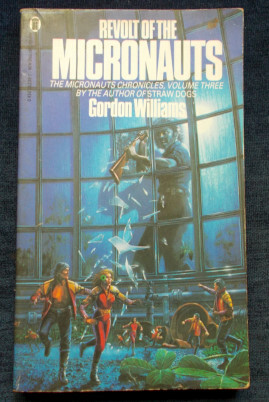 Book III of The Micronaut Chronicles. Pathetically few and ill-equipped, they were still both threat and promise. To the ruthless hierarchy of the Colony, they were a threat because they kept alive the idea of freedom. Yet if the rumour of Gudenian’s woman’s pregnancy was true, they were a hope for the future. Micro-cloned products of a coldly insane attempt to ensure human survival, the inhabitants of the Colony had not yet bred. One child, just one, would be a sign that they were a species with a life and future of its own – they were not just the sterile end-product of a failed experiment. Both threat and promise, they must be hunted, tricked and driven into captivity. Author: Gordon Williams. Category: Sci-Fi/UFO. Tags: NO spine creases, Paperback in very good condition., Some tanning, Tightly bound and clean within, Very faint edgewear.